That Black Friday discount may look like a good deal, but our year-long investigation has found that you could get a better bargain if you’re willing to wait. We tracked product prices for 12 months, and found that 87% were the same price or cheaper than their Black Friday price at other times of year. Some 46% of products were cheaper than their Black Friday price on at least one day during the six months afterwards. Find out more about Black Friday, including when it is and how to find genuine deals, in our guide to Black Friday. Should I buy on Black Friday? We crunched a year’s worth of pricing data for 94 popular tech, home and personal products that were on offer over Black Friday 2017, from six months before the event until six months afterwards. We looked at 59 deals from Currys PC World, 18 deals from Amazon, 14 from John Lewis and three from Argos. We compared this data with the price of the products on Black Friday itself. 87% of the products were the same price or cheaper than their Black Friday price at other times of the year. 86% of the products on offer were the same price or cheaper during the six months following Black Friday, and 46% were found at a lower price on at least one day in the six months after Black Friday. 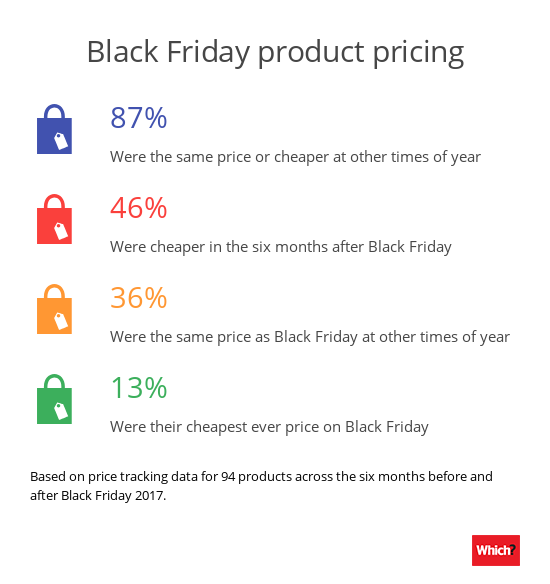 Unique bargains were scarce – only 13% of the products we tracked were at their very cheapest price of the year on Black Friday (meaning that the same price wasn’t found on any other day). 36% could be found at the same price as on Black Friday at other times of the year. Even when extending the period of ‘Black Friday’ to the two weeks surrounding the day itself, we found that 76% of products were still cheaper or the same price at other times in the year, and 74% could be picked up for the same price or less in the six months afterwards. Of course there are certainly deals to be had, and prices are often considerably lower on Black Friday than at other times of year. But if it’s the very lowest price you’re after, and you’re not in a hurry, it may be worth holding off. We found 26 products that were the same price or even cheaper both before and after Black Friday, so rushing out to buy them on the busy Black Friday weekend didn’t have much advantage at all. The LG 60UJ630V, a 60-inch 4K TV, was advertised at £799 by Amazon on Black Friday. In fact, it was £50 cheaper on at least 62 occasions after Black Friday and even dropped a further £150 for at least four days at the end of December and beginning of January. The Fitbit Alta HR activity tracker wasn’t advertised as a Black Friday deal, but was sold at £109.99 with a £10 discount applied by John Lewis on the day. It was cheaper on at least 60 occasions afterwards, starting with a further £20 discount in mid December and dropping to £39.99 for at least 21 days during March and April 2018. The 49-inch LG 49SJ810V TV was £599 on Black Friday from Currys PC World, but it was £20 cheaper from the end of December to mid-January, and again in April. The Sony Cybershot HX60B Superzoom compact camera was advertised as £189 (save £10) on Black Friday 2017, but we found it £10 cheaper at least 27 times in June and July 2017. It was also £10 or more cheaper at least 43 times in the six months following Black Friday, including on 33 days between December and January. Black Friday deals aren’t always advertised as the cheapest ever price, but when we surveyed Which? members, 64% said they would expect prices to be at their lowest during a sale than they had been in the previous six months. As our research shows, this isn’t always the case. 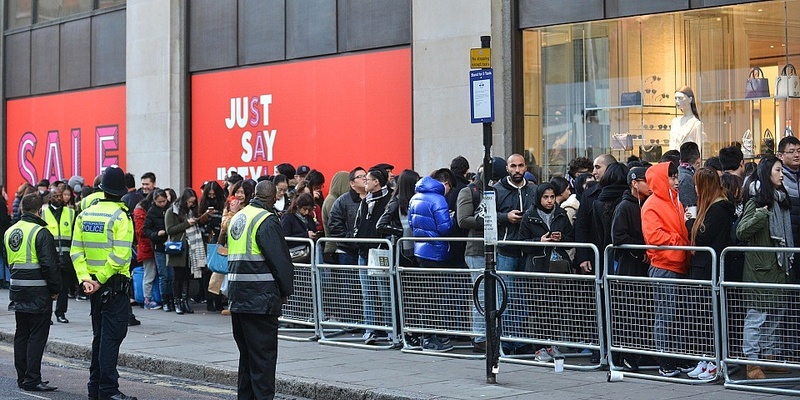 A John Lewis spokesperson said that prices are matched throughout the year as part of its Never Knowingly Undersold commitment, meaning that when high street competitors run promotions its prices are lowered to match, and that the Black Friday period is no different. While our investigation reveals that genuine deals are few and far between on Black Friday, that doesn’t mean there aren’t any bargains to be snapped up. So what’s the secret? Make sure you’re prepared, and don’t buy based on the claimed discount alone. Black Friday falls on the 23 November 2018 – ensure you read our tips on bagging a bargain before then if you’re planning to hit the shops. Most of us have been tempted into buying a product we don’t actually need by claims of a significant discount. But on Black Friday this could leave you with a product you weren’t planning to buy, bought at a higher price than it would have been at other times during the year. In previous years, we’ve also found rubbish products on sale over the Black Friday weekend – don’t get duped in to buying a dud and check our reviews before parting with your cash. Unless you’re in a rush for a particular product, our research has revealed that you could be better off waiting until after Black Friday. Of the products listed above, all were lower in price during December and January when compared to Black Friday. A year long Which? investigation into pricing secrets revealed the best times to buy for a range of home and technology products. We also found that the price of some products can vary by as much as 50% through the year, and often outside of sales periods or Black Friday. If a deal looks too good to be genuine, then it probably is. On Black Friday, it’s a good idea to steer clear of lesser or unknown brands that are on offer – it’s likely that these won’t be worth even the reduced price. Just because a TV has 4K and HDR plastered on the box doesn’t mean it’s going to have as good a picture as a Best Buy model. If you’re researching an unfamiliar brand, keep an eye out for fake reviews – our investigation reveals the facts about fake reviews.